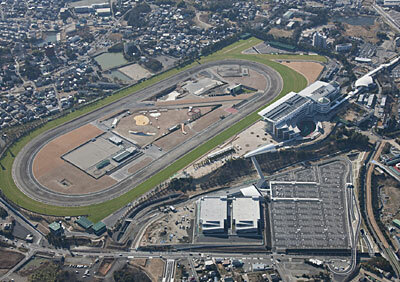 Located in Nagoya district, the largest metropolitan area between Tokyo and Osaka, Chukyo Racecourse ranks next to the four major JRA racecourses in prominence. Chukyo holds three race meetings each year. (Each race meeting usually has six to twelve days.) Its major races are the Takamatsunomiya Kinen (G1), the Champions Cup (G1), the Tokai Stakes (G2), the Kinko Sho (G2), the Chukyo Kinen (G3), the CBC Sho (G3), the Procyon Stakes (G3), the Falcon Stakes (G3) and the Chunichi Shimbun Hai (G3). In March 2012, this racecourse reopened after nearly two years of renovation work. Approx. 10 minutes on foot from Meitetsu Nagoya Main Line Chukyo Keibajo Mae Station.